I’ve been on a major avocado kick since my trip to Puerto Rico. I’ve always been kind of middle of the road with avocado, but they are definitely growing on me! I came home from work one night last week and went fridge foraging for dinner. I found some zucchini (nearing the end of their life), lemons, cilantro, leftover grilled corn, and a ripe avocado. I combined them all and called it DINNER! It was delicious! I quickly snapped a few pictures so I could post the recipe here on the blog. I added some shrimp to bump up the protein, but feel free to leave them off for a terrific meatless dish (or add some edamame instead…yum!). 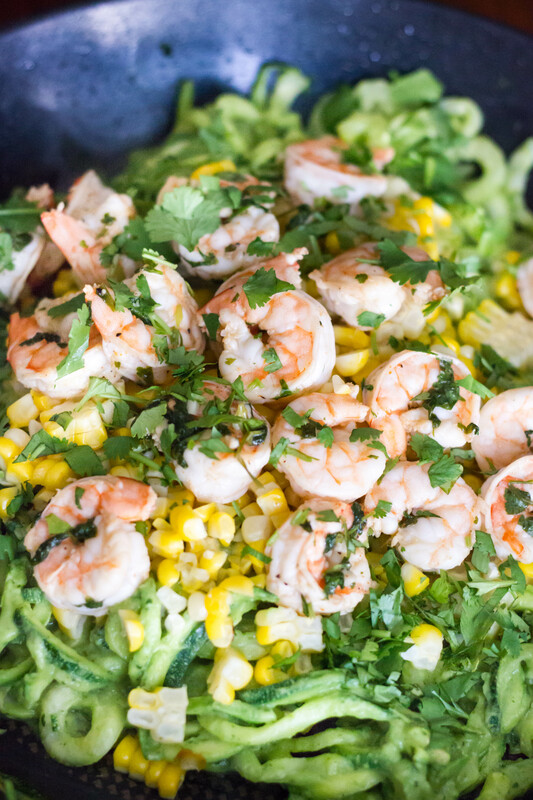 It’s a forgiving dish – add whatever veggies or protein you have. I’m thinking steak would be delicious with the creamy avocado sauce. In fact, I’m pretty sure this sauce would be delicious on all-the-things ;). A healthy, delicious dinner in 15 minutes. Give it a try and let me know what you think! Enjoy! 1. 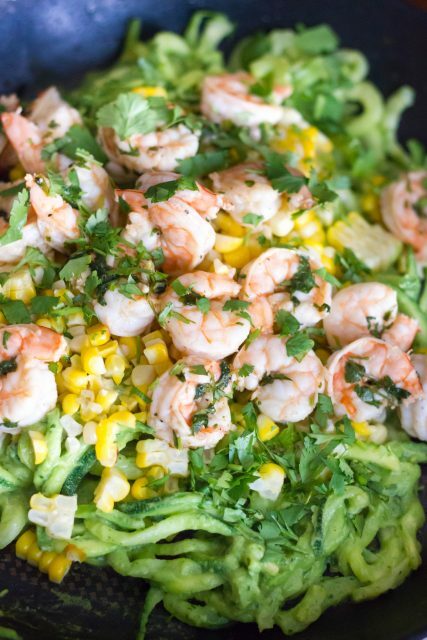 In large bowl, combine the shrimp and all ingredients for marinade. Let sit in fridge for a couple hours. While the shrimp marinates, prepare the sauce. 2. In blender or food processor, combine all the ingredients for the sauce. Puree until smooth. Cover and set aside. 3. Add about a teaspoon of olive oil to a large non-stick skillet over medium high heat. Drain shrimp from marinade and add to skillet. Cook 2-3 minutes or until pink and no longer translucent. Remove from skillet and set aside. Cover to keep warm. 4. In same skillet, add remaining oil. Add zucchini noodles and cook until tender, a couple minutes. Be careful not to overcook. 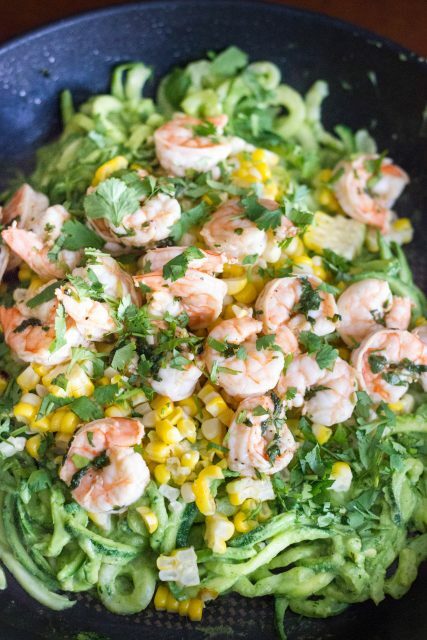 Once tender, add the avocado sauce and corn. Stir until combined and remove from heat. Top with cooked shrimp and garnish with additional cilantro, if desired. Adjust salt and pepper to taste. Serves 2.